BIRTHDAY BASH 2014 tickets are NOW ON SALE! 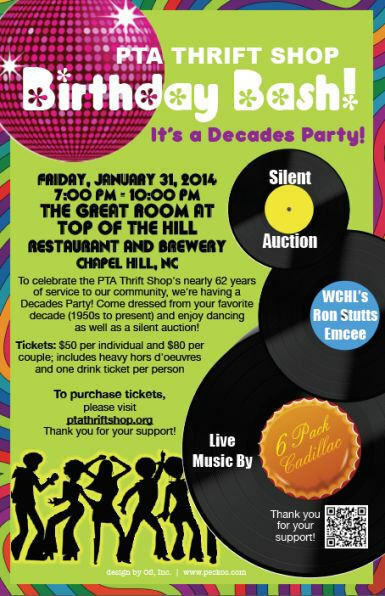 We are very pleased to announce that this year's installment of the PTA Thrift Shop BIRTHDAY BASH annual fundraiser and you can purchase your tickets NOW! Tickets are just $50.00 per person or $80.00 per couple, and the event will feature food, live music, dancing, a silent auction and much more! Please mark your calendars now and save the date! If you've attended our Birthday Bash celebration in either of the past two years then you know what a fun evening it is, and this year promises to be better than ever!